ALBUQUERQUE, N.M. – State transportation department projects that are improving safety on all travel modes, expanding mobility for communities, reducing congestion on roadways, and providing additional transportation options, all while saving taxpayer dollars, were today named recipients of top honors in the western regional America’s Transportation Awards competition at the Western Association of State Highway and Transportation Officials 2014 conference. Now in its seventh year, the America’s Transportation Awards competition – sponsored by AASHTO, AAA, and the U.S. Chamber of Commerce – recognizes the very best of America’s transportation projects in three categories: Under Budget, Best Use of Innovation, and Quality of Life/Community Development, a newly created category which honors projects that better connect and contribute to the general quality of life and economic development of communities. It is a record-breaking year for the America’s Transportation Awards, as more state DOTs than ever are participating (37 in total), entering more projects than ever before (73). Twenty-nine transportation projects from 15 western states were nominated in those categories. Two states were named winners in the Quality of Life/Community Development category: Texas Department of Transportation won in both the small and large project size categories—the West 7th Street Bridge project in the small size (projects under $25 million), and the SH 99/Grand Parkway Segment E (from I-10 to US 290) project in the large category (projects costing $200 million or more). Colorado Department of Transportation‘s September 2013 Flood Response earned top honors in the medium project category ($26 million-$199 million). The Under Budget category featured four winners: Idaho Transportation Department‘s Chubbuck Interchange (small project); a tie between New Mexico Department of Transportation‘s I-10/I-25 Systems Interchange Reconstruction project and Arizona Department of Transportation‘s SR303L, Glendale Avenue to Peoria Avenue (medium projects); and California Department of Transportation‘s Caldecott Fourth Bore Project (large project). In the Best Use of Innovation category, three winners were named: South Dakota Department of Transportation‘s Cliff Avenue/I-90 Reconstruction (small project), Wyoming Department of Transportation‘s Togwotee Trail to Yellowstone (medium project), and California Department of Transportation‘s San Francisco–Oakland Bay Bridge East Span project (large project). The winners in the two remaining regions will be announced at their regional meetings, held throughout the summer. The 10 projects with the highest overall scores will compete for the National Grand Prize and People’s Choice Award. The Grand Prize winner is selected by a panel of transportation experts. The People’s Choice Award is presented to the transportation project that receives the most online votes from the public. The America’s Transportation Awards Top 10 will be announced on Sept. 4, when the online voting will also begin. 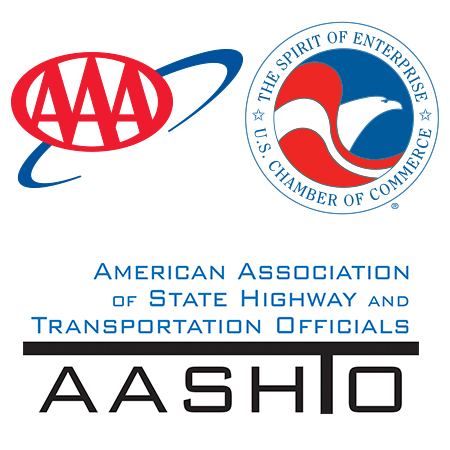 The winners of both national awards will be announced at the AASHTO Annual Meeting in Charlotte, North Carolina in November, where each winning state DOT will receive a $10,000 check to be given to a transportation-related charity or scholarship program of their choice. Learn more about all of the nominated projects and the competition here.